Sample preparation, loading, uneven transfer and transfer efficiency can all affect recovery and detection of proteins on the membrane. When evaluating the amount of protein of interest on the blot, it is vital to use a normalization control. Traditionally, detection of a housekeeping gene is used for normalization to control for inconsistencies. However, housekeeping genes have specific disadvantages as normalization controls. Total protein normalization is another method for normalizing protein expression. Total protein normalization can be performed using different dyes and stains, as well as a newer stain-free technology. This guide reviews several different methods of total protein normalization. To perform normalization using a housekeeping gene, the blot is probed with antibodies to detect the protein of interest while another set of antibodies is used to detect a separate protein used as a normalization control. For quantitative studies, the ratio of the abundance of the protein of interest to the normalization control is used to quantify the amount of the protein of interest in each sample. For qualitative studies, the loading control is often presented in an image for visual comparison. Housekeeping genes, such as such as glyceraldehyde 3-phosphate dehydrogenase (GADPH), beta-actin or tubulin, are commonly used for loading controls. These proteins are usually expressed constitutively at high levels due to their role in cell viability. However, several factors limit their utility as normalization controls. Studies have shown that housekeeping gene expression can change with different experimental conditions and differ between cell types and during different developmental phases (Liu, 2006; Moskowitz, 1995; Nahlik, 2003). The high level of expression of housekeeping genes often makes it difficult to detect a lower expressing protein on the same blot. The amount of protein required per lane to detect the protein of interest often results in a signal that far exceeds the linear dynamic range when detecting a housekeeping gene. For true normalization, the protein of interest and the normalization control need to be detected on the same blot. Unless the two proteins are sufficiently separated by gel electrophoresis and the membrane can be cut and incubated for each protein separately, many researchers rely on stripping and reprobing, which is not quantitative. Expression of the protein of interest is only compared to one other protein. Total protein normalization (TPN) is a technique that can be used to quantify the abundance of the protein of interest without relying on housekeeping genes. Traditionally, TPN is performed by incubating the membrane with a total protein stain, either before or after detection with antibodies. The abundance of the protein of interest is normalized to the total amount of protein in each lane, removing variations associated with comparing abundance to a single protein. TPN is also more compatible with detecting proteins of lower abundance. Normalization with total protein stains can be complex and time-consuming. While some stains can be used prior to immunodetection, others are incompatible with downstream antibody detection. In addition, some stains fade quickly making it difficult to document the results. A newer technique, called the stain-free approach, increases the sensitivity and reduces the complexity while saving time. 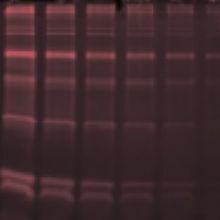 Total protein stains bind to all proteins on a Western blot membrane and provide a visual image after transfer. Depending on the type of stain, total protein stains can be used either prior to or after immunodetection. Some of the more common stains are described below. Anionic dyes, such as Ponceau S, and fluorescent dyes, like Sypro Ruby, Deep Purple and AdvanStain Scarlet are common stains used prior to antibody staining. Ponceau S is rapid and economical. Proteins stain red after just 5 minutes of incubation. The dye is easily removed after visualization by incubation in PBS or wash buffer. Although Ponceau S has no effect on downstream immunodetection, the intensity of the staining decreases quickly over time, making it difficult to capture an image. The red bands can also be difficult to photograph. Although more expensive and time-consuming than Ponceau S, fluorescent stains are highly sensitive, permanent, total protein stains that can also be used prior to antibody detection. Several companies sell fluorescent stains that have limits of detection ranging from 1.0 ng-8.0 ng. The stains are long-lasting and photostable, enabling long exposure times. Most stains can be excited with either UV or visible light and require a fluorescent imager for detection. Staining can be documented on photographic film or with a CCD camera. The staining procedure can take 30 minutes – 1 hours, depending on the stain. Note: Some stains contain heavy metals, which require special disposal procedures. Amido black is a commonly used permanent post-antibody anionic stain. Although not as sensitive as a fluorescent stain, it is more sensitive than Ponceau S and does not require special equipment for visualization. It is also more economical than fluorescent stains. The bright black bands are easy to document. Colloidal gold particles can be used as a total protein stain. When incubated with proteins bound to a membrane, the gold adsorbs to the proteins through electrostatic interactions resulting in a transient, reddish-pink color. The sensitivity can be enhanced through sliver enhancement, which results in a stable dark brown signal and detection of protein down to 1 ng. Colloidal gold staining is more expensive than other methods and cannot be used with downstream immunodetection. Stain-free total protein detection is rapid and sensitive. The technology uses a trihalo compound that is directly incorporated into the gel. Upon UV exposure, the compound modifies tryptophan residues in proteins causing them to fluoresce. The fluorescent signal can be detected by a CCD camera. Proteins can be visualized in the gel prior to transfer and after transfer on the membrane. Stain-free detection does not interfere with downstream immunodetection. Pre-cast gels stain-free gels can be purchased or stain free gels can be made in the lab by mixing a trihalo compound with acrylamide. Stain-free technology cannot detect proteins that do not contain tryptophans and it is recommended that a protein contain at least 2 tryptophans to be readily detected. Avoid edge effects. Dyes and stains can stain the edges of the blot more darkly than the interior of the blot. Be sure gels are loaded evenly. Establish range of linearity for each dye or stain.